The key to choosing the right skincare for you is fully understanding your skin type. Below, we explain the five different skin types in detail. Skin that is considered oily is prone to frequent breakouts and appears to be shiny and greasy. 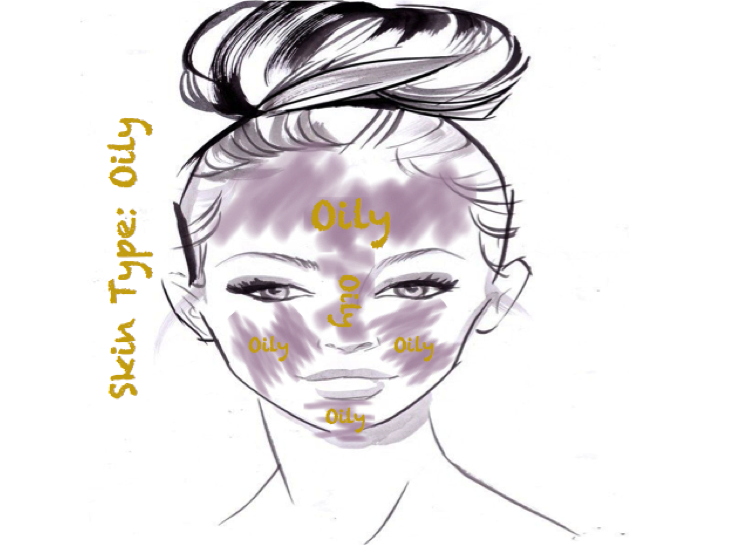 Oily skin accompanies large, congested pores causing the nose, forehead, cheeks and chin to appear oily. Oily skin is not oily throughout the entire day, these oily patches usually appear in the middle of the day. (See skin cycle) If you notice you skin getting greasy or shiny midday, you most likely have oily skin. Oily skin is caused by the overproduction of sebum due to an hormone imbalance. If you suffer from oily skin, you want to cleanse your face twice a day and exfoliate 2-3 times a week in order to keep your pores unclogged. Steer clear from oil-free cleansers because they can be too drying, stopping your skin from producing a healthy amount of sebum. Instead, use oils that are non-comedogenic, these oils will also resemble sebum and tells your body not to produce as much oil, promoting a healthy sebum flow. Combination skin is associated with a combination of both dry and oily skin. The oily portion of the skin the T-zone which includes the forehead, nose, and chin. The dry portion of the skin is the cheeks, around the eyes, around the mouth. If you notice your T-zone becoming oily midday and you cheeks becoming dry, usually with weather or hormonal changes, then you most likely have combination skin. Oily skin is caused by hormone imbalance and genetics causing one area of your face to overproduce sebum and other parts of your face to not produce enough. Environmental factors such as weather can also have an affect on drying the skin. 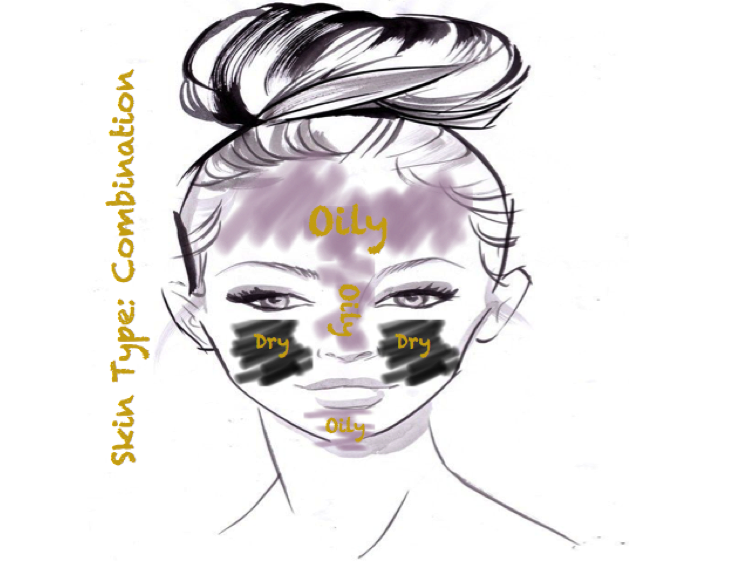 Ingredients in certain skincare products and also keep cause combination skin by being drying or irritating, these products dry out one part of your face that may be considered to have a normal skin type and cause the T-zone which may be considered oily to produce even more oil. Those with combination skin can benefit by using a toner that balance skins pH to bring skin to it optimal health controlling both oily and dry skin. Deep cleansing of pores, gentle exfoliation 2-3 times a week, steam treatments, and use of humidifiers during winter months, hydrating, and treating only the T-zone with clay masks can be helpful for those with oily skin. Sensitive skin can be considered oily, combination or dry but those with sensitive skin experience skin that is easily irritated associated with a burning sensation. Those witch sensitive skin have to pay close attention to the products they put on skin being that every one has sensitivities to different products. If you use a product on your skin and it becomes red, inflamed, or you feel a burning sensation you are most like sensitive to those ingredients and should discontinue use. Choose natural skin care products that are directed to sensitive skin being that commercial products directed towards sensitive skin can contain products that still cause skin sensitivities. Dry skin can appear to be flaky, dull, ashy, be associated with peeling skin, and feel tight. The dryness occurs over the entire face and is less prone to the development of acne. Dry skin can be caused by genetics, lack of hydration and sebum production, and environmental conditions with low humidity, exposing skin to hot water, or drying air conditioning or heating system. Those with dry skin should not use harsh cleansers but those that are hydrating and oils, moisturizers and serums that have the ability to penetrate beneath the skins surface, steam treatments, humidifiers during winter months and hydrating masks . Those with dry skin should also exfoliate 3-4 times a weeks to help with the turnover of dead skin cells on the skin’s surface. 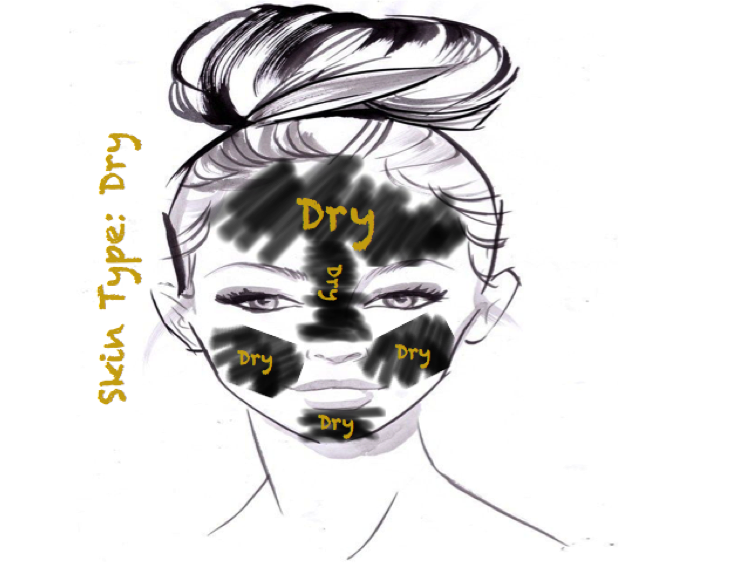 Normal skin is nether, dry, oily, combination, nor sensitive. Normal skin can have a breakout here or there but no excessive break outs. The products used for those with normal skin should be extremely gently to ensure that they won’t cause your skin to be dry, oily, a combination of the two or sensitive. Cleansing, moisturizing, and exfoliating maybe once a week is required for those with normal skin and spot treatments for when blemished do appear.